We've all heard the skeptics "social media can't really help in serious genealogical research". I like to call these people the "Snootie Patooties". Last year a fellow Geneablogger used that term in one of her posts and I've basically stolen it from her because I like it so well. I will admit that day in and day out social media alone is not going to be the source you use when trying to add another branch to your tree. But, keep an open mind you Snoots, because you can make progress via social media simply by utilizing the reach this medium gives you. Historic Map Works - the Lincoln (NE) City Libraries recently added this feature from ProQuest. I found a 1905 map that shows land owned by my gg grandfather. Very Nice!" 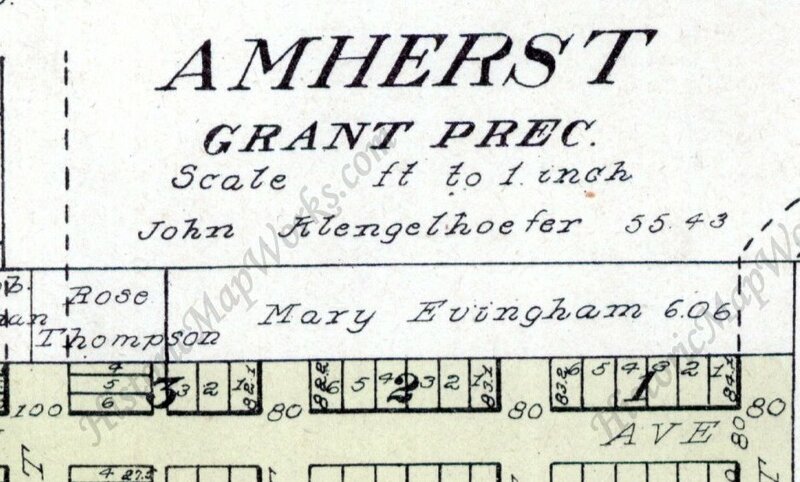 I knew that my Great Grandmother, Mary Evingham, was a landowner in Amherst, Nebraska around 1910. I asked Susan to do a look-up for me, which she so graciously agreed to do ;). Within two hours of seeing her posting on Facebook, I had a map in my inbox. 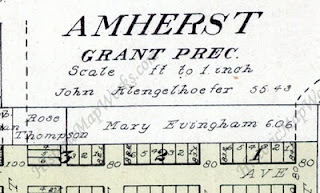 Below is a snipit of the map and look who we have...Mary Evingham, my Great Grandmother! I have the deeds where Mary bought and then sold the land and now I can actually see where it was. Mary is listed as a widower on the deeds, so I still have no idea who Mr. Evingham was. I posted previously about Mary, I wonder if this photo was taken in Amherst on this property? Lesson learned: don't count on Social Media, but never rule it out! Glad I could help! I get an even bigger satisfaction when I can help another researcher find something they are looking for.